Before I begin my review I want to make it known that I am a complete Valiant noob. I have never read anything from them nor did I really know of their existence before this re-launch. Basically, the only thing I knew about the series was the synopsis that I had read. However, this is exactly why I wanted to review this title. 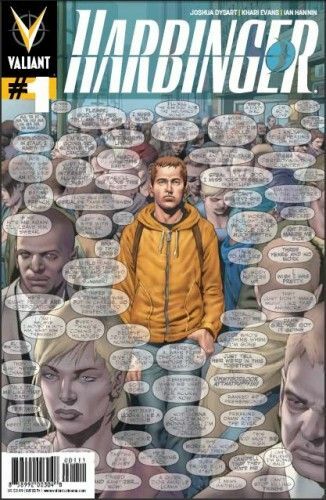 It has been 20 years since Harbinger was first released and that is a whole lot of readers in the same boat as I am. This issue starts in 1952 with Toyo Harada entering what from the outside appears to be a temple. He is met by an army all-aiming right at him. Not a big deal, because all he has to do is tell them to shoot each other and they oblige. Out of that, we get some nice exploding heads and blood. This is where Toyo meets a bleeding monk and this story really begins. We are now introduced to the protagonist of the series, Peter Stanchek. Peter, for those of you that do not even know about the series, is a Psiot. This means he can hear people’s thoughts, but unfortunately for him he cannot control this power. Think about those times when someone just keeps talking and will not stop it. Now imagine that happening, but with hundreds of people all the time. This is what Peter deals with every day, which is enough to make anyone crazy. The way he deals with this is by popping pills. I do not want to go through the whole story and spoil it for everyone. The story brings you into a world that is very much reflective of our own. Peter is a rough character that many people would probably find hard to like but will be dragged into his story. Peter is a young kid on the run with his friend trying to figure out who/what he is. He appears to be a deep and somewhat damaged character that I believe many people can relate to in some way. When I saw the covers and some of the preview art for this series, I loved what I saw. However, I was a bit disappointed once I got reading. Do not get me wrong there were some great scenes but others were grainy and left a bit to be desired. I will blame this more on the digital copy I was reading and will update everyone once I get a real copy in my hands. One thing that was great about the art was the emotion that Khari Evans was able to portray. This was so important to the issue because so far Peter seems like a reserved character that needed his emotions shown. There is so much going on in the issue that it creates such a vast world. As my second experience with Valiant and my first with Harbinger, I am sold. The story grabbed me from the start and I already feel invested in the characters. I am already excited for issue #2 and cannot wait to keep reading what I hope to be an amazing series. Parental concern: Mild violence, blood and drug use. Harbinger hits shelves on Wednesday, June 6th. After re-reading it in print I take back by my grainy take on the art. It is clean and vibrant and portrays the characters awesomely. So is Valiant pitching perfect for SMC so far? No duds yet? @Chance: Great review sir. I’m sure the physical copy would improve some things, but I was maybe just a little less impressed with the interiors. I think I felt like everyone looked stressed out or something. Still, the story was great and there is a ton of juicy morsels to chew on with this first issue. The moment where Peter takes things just a bit too far with his childhood friend? Whoa. Lots of issues to deal with there. Also, liked how they touched on mental illness with his travelling buddy. @Jason: I would say not! Valiant is impressing! Seems like the indy’s in general are stepping it up a notch. Good work Chance. @Chip The only character that seemed stressed to me the whole time was Peter. But that made sense to me because he’s on the run and everything that’s going on. It’s not my favorite art ever but I think it worked well with the story.